Obituary – Berryman, Doris Mae (Casparis) « Perry High School Alumni Association, Inc.
French Club ’20, Commercial Club ’21, Peoma, D.D.D. Doris Berryman, 84, north of Perry, died at 11:21 p.m. Monday, November 12, 1990 at Stillwater Medical Center. Funeral will be at 2 p.m. Thursday at the First Christian church of Perry. Rev. Lynn Scott, pastor, will officiate. Burial will be at Grace Hill cemetery under direction of Brown Funeral home. Mrs. Berryman was born at Round Mountain, Texas, on March 8, 1906. Her parents were Jake and Lola (Marshall) Casparis. She moved to this area in 1910 and attended Noble county schools. She and E. F. Berryman were married on Oct. 4, 1934. 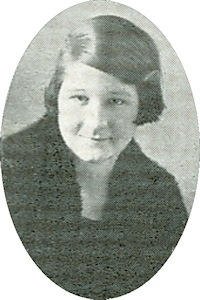 Mrs. Berryman was a member of the First Christian church and Christian Women’s Fellowship circles. In addition to her husband, survivors include one sister, Christine Trussell, Perry ; and several nieces and nephews.